Even an Americano can set you back 3 pounds a day, not to mention the time to waste waiting for it to be made. Nescafé has created the perfect way to make coffee that is on par with the best coffee shops in town for less than 40p a cup! Imagine the money you will save and still be able to enjoy fantastic coffee! You can enjoy over forty drinks in the range, from Caramel Latte and Americanos to the latest breakfast cup, Preludio, which is now available on the Nescafé Dolce Gusto webshop and at a number of retailers including Tesco, Sainsbury’s, Waitrose and other leading supermarkets. The Nescafé Dolce Gusto coffee maker isn’t just stylish (it has removable backs in varying colours to suit any environment), it is perfect to use at home or in the office. Just one fill of the water tank can make over 25 espresso’s and it is very simple to use, you just flick a switch and choose the size of coffee you fancy. I took mine to the office and had the girls gushing over the quality of coffee that I made, although I can’t take the credit as it was all down to this fantastic little machine. Here are just some of the points that make the Nescafé Dolce Gusto Colors by De’Longhi so great. 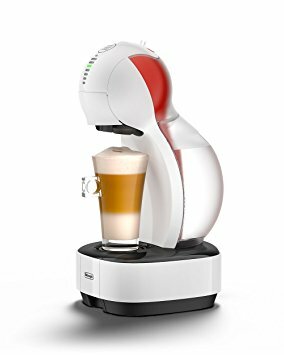 It is available at www.johnlewis.com and other leading retailers from £77.99, with such a great price point it makes the perfect gift for coffee lovers and I am tempted to buy one to use at home too.